If Game of Thrones has taught me anything is that weddings are dreadful. I think Vincat agree. And who can blame them when the last wedding they attended ended in a shooting + car crash. However, what they dread the most is facing their respective families. Vincent gets an unsolicited visit from his very distant cousins, while Cat is forced to welcome “two tiny aunts with giant suitcases”. Funny enough, I’ve been toying with the idea of Cat’s aunts since S2. Granted, I had more of a “Vanessa’s evil sisters who secretly run M” plot in mind [something like the Derevkos]. In this fantasy scenario, the aunts would have been played by Kelly Hu and Ming Na Wen. But I digress. The shooter turns out to be a “beast-like” man in a random shooting spree. Vincent is able to neutralize him, but COUSIN HANK is shot in the process. Hank and beast-man are taken to the hospital. JT also comes along to run some tests. Do people realize that JT has his own job/life? He spends most of his time doing V’s lab work and forensics for Tess and Cat. Has JT been fired from the university? I hope not, I’ve always assumed he was a super cool teacher. In any case, JT discovers that beast man is merely a man now. Apparently he was infected with a 24hr “beast virus”. So whoever is in charge of THEE SERUM has changed its tactics and is now targeting random civilians with a potential BEAST OUTBREAK. Dun dun dun… Interesting development. And from boys and strippers to fainting ladies and high tea. Cat finally shows up at her apartment to face AUNT LILY and AUNT CLAIRE. Cat is clearly going through something. Heather concludes that Cat is sad because she wishes their mom was there for the wedding. It is actually the opposite. Cat is conflicted because everyone keeps bringing up her perfect family and all she can think of is that Thomas wasn’t even her real dad and her mom experimented on the love of her life. Heather is unaware of the latter, which I hadn’t realized! But I guess it is true, she found out about Beasts, but Cat never told her about their mom’s involvement. [I am so glad this didn’t happen off screen]. But both Cat and Vincent are forced to put their family drama on hold because they have a beast-outbreak to contain. JT makes a new discovery: The virus has proto-beast DNA. 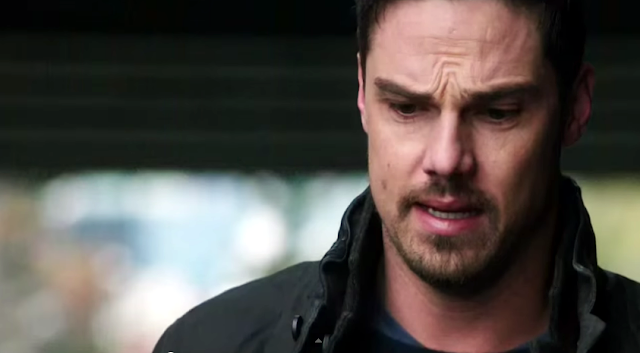 So Vincat are forced to pay a visit to the only living person who is an authority on all things beast: Daddy Bob. I love Daddy Bob! But the visit wasn’t exactly productive. All they got were some passive-aggressive remarks and the GROUNDBREAKING ADVICE that Vincent should TRACK the beast-infected subjects… because they have proto-beast DNA which is part of him… WAIT A MINUTE. Yes… I am wondering about tracking… AGAIN. Let me see if I got this. Vincent can’t track the infected subjects because they are an unknown variable. However, he could track the traces of proto-beast DNA they have (constant) and find the source. That actually [kinda] makes sense. Tracking logic achieved. However… OK I’ll stop here or this will end up being a tracking essay, but if someone wants to discuss this further, hit the comments. Daddy Bob also spends a fair amount of time defending Vanessa [could it be that he loved her for real?] and tells Cat to look into the box of mementos he gave her. Cat’s all “I think I’ll pass on that particular Pandora box, now if you excuse me we need to go track something with questionable logic”. However, Catherine is forced to delegate the big bad quest and make an appearance at her bridal shower. Heather gives a toast congratulating her big sis on finding her “Prince Charming” [WRONG fairy tale] and mentions her mom would be so proud of her [WRONG thing to say]. This sends Cat over the edge and she explodes in front of the entire party outing Vanessa as a beast maker… OK not quite, but she does say that Vanessa “tried to destroy Vincent” and that she will never forgive her for hurting him. She was probably being a little hard on her late mother, but I thought there was something incredibly beautiful about Cat feeling Vincent’s pain as deep as if it were her own [or maybe even more since V doesn’t seem to hold a grudge against Vanessa]. I don’t think Cat ever thought Vanessa was truly evil, but finding out [post-mortem] that a parent lied about such major things [beast-making, bio-dads] would make anyone have mommy issues. In the meantime, JT gives V some of his blood samples to help with the tracking because – as it turns out – JT had proto-beast DNA in him as well. He mentions that this makes them “blood brothers”. The idea makes Vincent very happy. Aw the bromance! Not getting any bromantic love any time soon is COUSIN HANK. Turns out cousin Hank had always felt jealousy and resentment towards V’s side of the family. The only reason he even showed up was to use “Vincent-the-war-hero” as part of his campaign for Councilman. So that’s it for reconnecting with family then. [Although I wouldn’t mind seeing Aaron again]. Finally, they corner the messenger, only to realize that the whole thing was a trap [Oh.. when will Vincent and Catherine learn?] The messenger takes pictures of Vincent and Cat and transmits it to the elusive BIG BAD. Then the messenger gets instructions to make an impossible jump across a rooftop. He dies. The big bad literally killed the messenger. BACK AT THE GUILD, JT tries to remain positive and mentions that stopping an epidemic is always good. Vincent points out that falling into the trap of a –yet unknown – evil mastermind using NY as his/her personal lab is NOT good. They are all unsure of their next move. JT suggests moving to Tahiti [I hear it is a magical place]. Cat goes home and starts going through her mom’s box. I always find it funny that characters who get tragically killed ALWAYS leave a box of clues + farewell videos behind [maybe there is a correlation, farewell video = DEATH]. Anyway… Cat goes through the box and finds pictures of her and Vanessa, then she finds a recording Vanessa made many years ago. On the tape, Vanessa basically explains that she had good intentions at heart, she wanted to make the world a better place for the daughters she loved dearly. I think Catherine already knew all this, but it is different to actually SEE her mother’s heartfelt speech. She completely breaks down and realizes that she had been holding on to her anger because it was easier than being sad [as she later explains to V]. It is heart-breaking to see Cat come full circle and forgive her mother for what she unintentionally did to Vincent. Heather finds her sobbing and the two sisters hug as they continue to cry. And this is what I was talking about last week: This is the type of scene I am going to remember. And after watching this, I would kill anyone who dares say KK isn’t a good actress. She made me cry [real tears] on every rewatch. Later, Cat meets up with Vincent at one of the churches they were scouting for their wedding. Cat explains that she has finally made her peace with what her mother did. Vincent tells her that he just wants to get married, no more obstacles. Cue BIG BAD having a big baddish entrance. Someone throws grenades into the church, Vincat escape and a… supersoldier assassin maybe beast guy [I dunno what his deal is yet] enters [Was that Jason Gedrick? Do we have confirmation?] What was the point of this bombastic entrance? Was he trying to actually hurt Vincat? [In that case a sniper gun would have been much more effective] or was it all about theatrics? I think the latter. I really really liked this episode. The characters went through emotions that felt deep and true to themselves [and they weren’t spelled out to death]. The overarching plot was moving forward and even details like the outbreak [and to some extent the tracking] made sense! Anybody else think Cat and Vincent should elope? Every criminal and every mad scientist use the exact same excuses that Vanessa did, good intentions at heart, make the world a better place, protect their (own) children, yadda, yadda, yadda.The 2 minute sob feast scene would be heart-breaking if Vanessa's taped speech hadn't been so false, banal and insincere. If they really wanted a redemption of Vanessa they could have come up with something less cliché. I don't think it is really Cath's place to forgive her mother for what she did to Vincent. Vincent hasn't actually forgiven Vanessa or Bob, he just realizes that Cath is not her parents and he cares only about her. The main reasons that we forgave Cath in season 2 was that she finally admitted unreservedly that he had been hurt by Vanessa and Bob. Now Cath is back to caring about herself, that it is harder for her to be sad. Boo-hoo, at least you are not made into a beast for life, girl. I found it very strange that Bob Reynolds had Vanessa's dying video in his possession. How? She was married to Thomas Chandler and at the Chandler house when she was taping her... confessional... or whatever that was. Nothing much in the way of a confession. She experimented on people for 20 years without improving the serum, either a really bad scientist or some sort of egomaniac. Chalk that strange plot device right up there with the coffee shop stripper playing easy listening music. Bob of course didn't have the video unless he stole it later somehow, probably after killing Thomas Chandler. I want to add that I agree that KK is intense in the scene. I am sorry I called it a sob feast. But I was so irritated that the writers made a mockery of that raw, silent emotion by the fake sounding defense speech.